IT MAY not have garnered much excitement yesterday but one councillor said a new zip wire would help transform an Oxford play area. 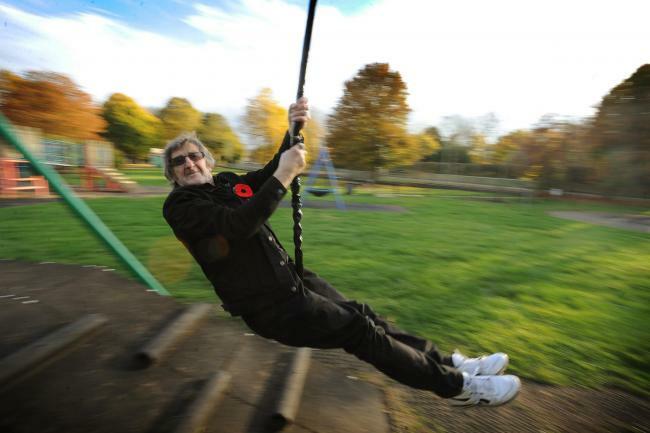 Oxford city councillor Mick Haines has long campaigned for the suspended wire play equipment at Marston’s Croft Road Recreation Ground. And after much anticipation he was on hand to mark the grand opening of the new ride, and of course to have a go himself, now contractors have finished putting it together. 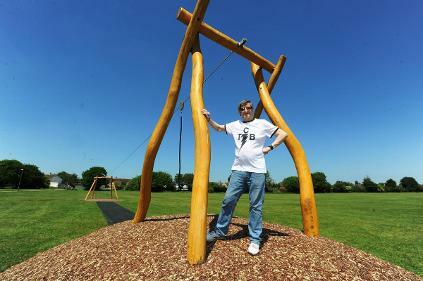 Although the park was deserted for the big launch, Mr Haines said it would get plenty of use over half term. He said, shortly before hurtling down the line: “The kids will love it when they come to the park and it will be packed this bank holiday weekend. “I am very happy with it. It has been a long battle to get it but it has been all worth it. It will be great for the kids and a great thing for the park. The city councillor first set his sights on installing the wire two years ago. At a cost of £5,000, it was funded partly from contributions made from the Friar’s Court housing development as well as Mr Haines’ own council budget. He said the equipment, and more like it, was ‘badly needed’ in what he described as a ‘forgotten park’ in the city. He added: “This is just the start of more play apparatus here. The park needs more and Marston has been left behind compared to other areas. The football posts at the park are set to be replaced as part of an overhaul, he said, and Mr Haines now has his eyes on getting a sandpit as well as other amenities to boost the park. He said: “It’s about getting a centre for the local community of Marston. This park is very well used. There are 50 to 60 people using it at times, more in the good weather. “Of course it will only get more use with the zip wire. Zip wires have become increasingly popular across the city’s parks and beyond. County council leader Ian Hudspeth famously opened Woodstock’s new play area, its first zip wire, by hurtling down a zip line in September 2014 after Woodstock Town Council installed the equipment. And then in May 2015 Oxford’s Herschel Crescent Recreation Ground in Littlemore was officially opened which also included a zip wire. A PRE-EMPTIVE petition aimed at securing the future of a Marston day centre has gained more than 1,000 signatures. 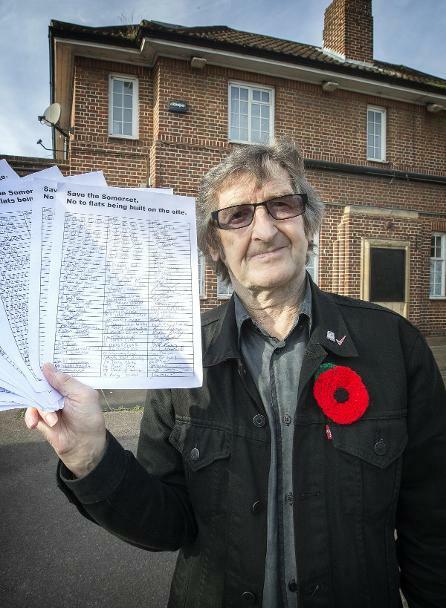 Oxford city councillor for Marston Mick Haines first launched the petition last month in a bid to drum up support for the Marston Court day centre in Marston Road, Oxford. The petition ended on Sunday and Mr Haines, who was the brains behind the drive for signatures, said that he had secured 1,280 names in support of the centre. He said: "I am really very pleased with how it has gone and everybody who has signed it and I have spoken to all say what a wonderful place it is. "A lot of people I have asked said just how great the people working there are and how well used it is and how important it is for the community. "Some have said that their parents and their grandparents may be the ones using the day centre next so it is important to support it for everybody's future." The centre, run by the Orders of St John Care Trust, has not been earmarked for closure but the councillor said that he wanted to show Oxfordshire County Council just how much support there was for the centre in his community anyway. It is used by between 12 and 15 people each day and employs between two and three people out of the regular care home staff on a daily basis, operating out of the care home between 10.30am and 2.30pm every week between Monday and Friday. Mr Haines' petition was first launched in response to the county council's plans to reduce the number of council-funded day centres from 22 to eight, saving £3.14m each year by 2019. He said that he wanted to show just how much support there was for the day centre locally in the event that the Marston centre was ear-marked for closure in the future. He added: "Twenty two are going down to eight which is a big concern so I thought I would set up this petition in the first place to show just how well supported it is here so that we might secure its future. "Everybody said what a great facility it is and just how important it is and I will keep this petition in the event that the county council decide to choose this day centre to close." Marston Court provides residential care for 39 people, with the separate day centre operating out of the same building. It offers an opportunity for people to socialise and meet others or allow the person caring for them to take a break or run errands. A LONG-AWAITED zip wire will finally be up and running from today. The play facility at Marston’s Croft Road Recreation Ground has been under construction for the last few weeks after city councillor Mick Haines pledged to install it. Speaking before the launch, he said: “I think the kids will love it once it is up and running. “I have been for ages trying to get a zip wire in there and now that we have the money we can. The zip wire which costs £5,000 has been paid for through contributions from the Friars Court student accommodation project, completed last year in Old Marston Road, as well as Mr Haines’ own council budget. Old Marston Parish Council vice chairman Duncan Hatfield said: “I think it will be a great thing for the area; a great asset. It will be fun for the children. It certainly gets a lot of use at the other ground at Northway. County council leader Ian Hudspeth famously opened Woodstock’s new play area, its first zip wire, by hurtling down a zip line in September 2014 after Woodstock Town Council installed the new play equipment. In May 2015 Oxford’s Herschel Crescent Recreation Ground in Littlemore was officially opened which included a zip wire. A CITY councillor has criticised his own council for not doing enough to fix a pothole ‘blackspot’. Mick Haines wants Oxford City Council to do more to fix the blight of potholes and crumbling pavements plaguing his Marston ward. He singled out the area around the Haynes Road and Arlington Drive, insisting it was an accident waiting to happen. He said: “It has been going for years and they are doing nothing about them. “I am contacting the council and have been told that they are going to do something about it but nothing has happened. “An elderly woman living nearby tripped and fell over in Haynes Road the other day. “It is a serious accident waiting to happen. All around this area the roads and pavements are terrible. 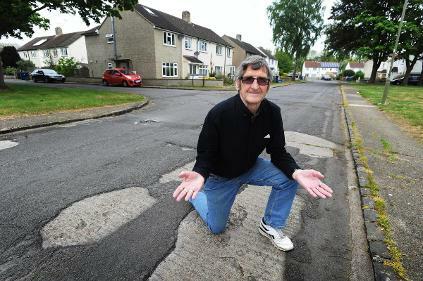 “Haynes Road has been bad for years and people have complained to me about this problem for years. The maintenance of the highways across Oxford and Oxfordshire is divided between Oxfordshire County Council and Oxford City Council, with most roads under the remit of the county council, but with some exceptions such as at Haynes Road. In February, it was revealed that although the county council had ordered the repair of more than 25,000 roads and footpaths in the last year alone there was not enough money in the council coffers to cover the cost of smoothing over the 2,800 mile road network each year. In response to the fresh concerns, the council said that although it accepted the road was 'in a poor condition' there simply wasn't enough cash to put into repairing the road. Spokesman Tony Ecclestone said: "We are aware of issues in Marston. These are low speed, 20mph residential areas. The carriageways are made of concrete with a layer of macadam overlay. "The surface is showing signs of wear, which cosmetically looks in a poor condition. However financial constraints mean that the council must prioritise repairs. "The council inspects all reported defects to assess their condition and many of these ones are low priority. "We also carry out highway inspections as part of our highway inspection policy. Haynes Road has been identified for funding for a scheme along with others in the Marston area." Cllr Mick Haines testing out the zip wire at Mortimer Hall recreation ground in Marston. SPRING has arrived and with it the hopes of dozens of school children – and possibly adults – awaiting a promised zip wire. Councillors pledged last year to install the feature in the Marston area of Oxford by this April. Now a councillor for the area, Mick Haines, has confirmed that contractors have been appointed and are gearing up for the work, which is set to take two weeks to complete. If all goes according plan, the councillor said, the workers will be on site as early as next week. He said: "They are still working towards starting to build before the end of March. It depends on the weather when contractors can get started. "Once it's all up and running, it will be fantastic for the kids." The £5,000 piece of play equipment allows users to slide on a suspended harness. There are similar zip wires already installed at nearby parks in Northway and at Mortimer Hall recreation grounds, along with other parks across the city. The zip wire is being paid for through contributions from the Friars Court student accommodation project, completed last year in Old Marston Road, as well as Mr Haines' own council budget. He said that the facilities were badly needed in his part of Oxford and added: "We are behind in Marston with facilities like that and we could definitely get more. "We could all do with some more play equipment, and better facilities, for the parks in our community." Before the new equipment was announced, Old Marston parish council completed a survey of nearby schools, asking what children wanted for their community spaces. The top item on their wish list, according to the council, was indeed a zip wire. Parish council vice chairman, Duncan Hatfield has said: “I think it will be a great thing for the area; a great asset. It will be fun for the children. It certainly gets a lot of use at the other ground at Northway. Oxfordshire County Council Leader Ian Hudspeth opened Woodstock’s new play area, its first zip wire, by hurtling down a zip line in September 2014 after its town council installed the new play equipment. In May 2015, after two years of planning, Oxford’s Herschel Crescent Recreation Ground in Littlemore was officially opened which included another zip wire ride.